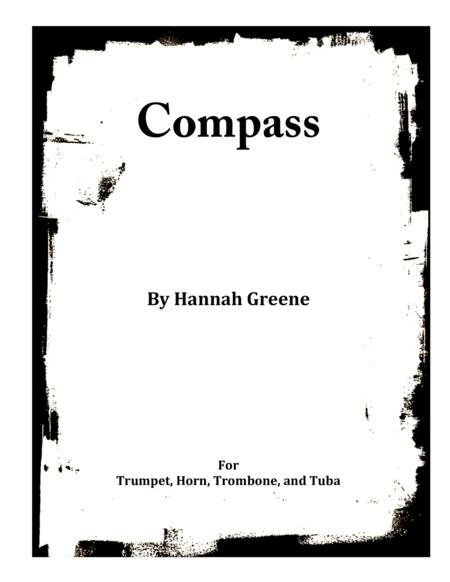 Compass was written so that each instrument represents the four corners of the earth and their respective “winds”. The performers should play from all four angles of the audience so that the sound surrounds the room. The Trumpet should stand at the front of the audience. They represent the “North Wind.” In Greek mythology, Boreas was the god of the north wind and bringer of cold winter air. All compasses point north, therefore the trumpet is the leader. He begins the piece and calls all to join him at the end of the piece. The Trombone should stand on the right side of the audience. They represent the “East Wind.” Eurus is the Greek god of the east wind. He is unlucky and a bringer of evil things. The Tuba should play behind the audience. They are the “South Wind.” In Greek mythology Notus was the god of the south wind and brought late summer and autumn storms.The French Horn should stand on the left side of the audience. They represent the “West Wind.” In Greek mythology, Zephyrus was the west wind and brought springtime. It is considered the mildest wind. To add another cyclic layer to the piece, each part was written in a different key signature according to their orientation on the compass and the circle of 5ths. The trumpet was written in C Major. The trombone is in A major and switches between A minor. The Tuba would be in F# major but was written in F# minor—they switch between the two keys. The Horn is in concert pitch Eb major (transposed to Bb major). Back to School 2015Score includes parts for each instrument.